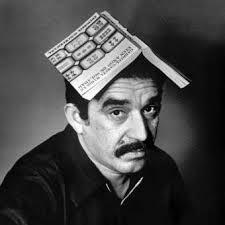 The best tribute to author, Gabriel García Márquez, at this year’s Academy Awards (other than being mentioned in the In Memoriam segment) was the big win for Alejandro González Iñárritu’s film, Birdman. García Márquez’s beautiful, mythical, and mystical stories and González Iñárritu’s disturbing and dark film both fall into the genre of magical realism. From Wikipedia: Magical realism, magic realism, or marvelous realism is literature, painting, and film that, while encompassing a range of subtly different concepts, share in common magical or unreal elements that play a natural part in an otherwise realistic or mundane environment. Magical realism is the most commonly used of the three terms and refers to literature in particular. It’s an acquired taste and I’ve been happily immersed in the genre for several months reading books by both García Márquez and Haruki Murakami. I don’t know why I’m attracted to these stories of dysfunctional families, ghosts, and talking cats…but I am. Perhaps it’s because I’ve always believed in the miraculous and love how it’s conveyed through art. I’ve only started querying my own novel, The Model Home, a story about love triumphing over greed and materialism. It falls into this lovely genre of magical realism and after last night’s win, I’m encouraged. Birdman is dark. It plays with our emotions and shows human nature at its very worst. But that’s where the lessons are. In the worst of times. I’m happy it won this year. It’s a great tribute to the author of the greatest Latin American novel ever written, One Hundred Years of Solitude, and the entire genre of magical realism. ← Love is a temporary madness. I am reminded of The Milagro Beanfield War, another book and movie with elements of magical realism. Is this mode of story-telling a Mexican discourse? Viewing the movie through this lens made it make sense to my too often literal way of interpreting a story. And I loved it. Chuck. Thanks for reading. Yes, MR is usually associated with Latin American literature. Isabel Allende is one example as is Garcia Marquez. Only recently have I started reading others (not Latin American) such as Haruki Murakami, Sarah Addison Allen and Aimee Bender. I’m partial to Murakami though. Extremely good writer. Thanks for commenting. Happy reading!